I try to post new art on Fridays but I had a moment to get this one posted. Enjoy and please share! 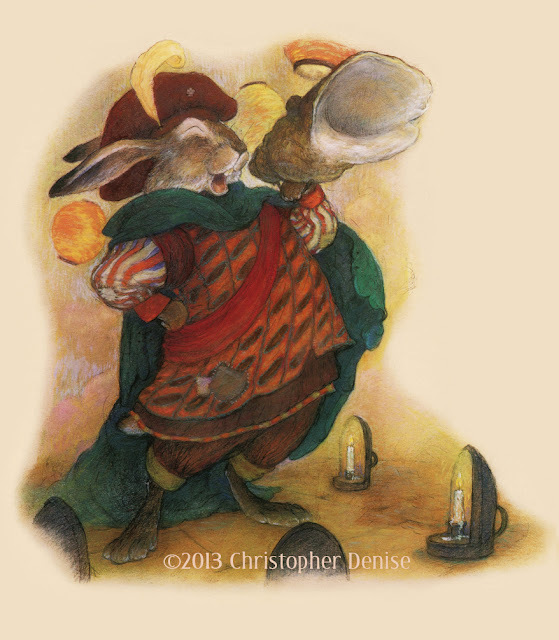 "This large scale portrait of Hypericum Hadduck Hare was created for pages 18-19 of A Redwall Winters Tale by Brian Jacques and published by Philomel Books in 2001. Hypericum was the leader of the rag tag group of minstrels and clowns named The Thistle Down Troupe. I jumped at the opportunity to research the costumes for this Shakespearian, slightly down on his heels, but still larger than life character. I think I could have created another whole book just focused on the troupe! This is the original pastel and charcoal painting and it is quite large. I was creating all the artwork at 133% of the reproduction size. The live art area measures 13 1/2" high and 12 1/2" wide." Illustrator note: Thinking is actually doing. Just a quick post as I am knee deep in paintings but thought I would add a little Illustrator note-perhaps only to remind myself of the importance of taking a moment to step back and think about the piece that you are currently working on. The thinking before you take up the brush or stylus is vital, but that is a whole different post. I have been cranking out paintings at a ridiculous rate. Deadlines have made it so. I can get the paint on the piece and have it looking pretty good fairly quickly but we all know how easy it is to ruin an illustration by overworking. If you think you are about done, take a break-work on something else for a few hours. When you come back try to trick yourself into viewing the piece through the a fresh set of eyes. Ask yourself; are the rhythms working, the dark light balance, have you lost the drawing? I am a big proponent of adopting Illustration/painting mentors to guide you through a project. I collect examples of work that appeal to me and speak to the look and feel that I am striving for in a set of paintings. Take a moment to open those files and really look at the paintings and evaluate your own work in that context. Finding that little bit of space can be just the thing to suggest the few tweaks to your own painting and hopefully save you hours of fiddling around. This little bit of thinking work is just as, if not more important than the physical work of creating the illustration. Old news to many in the craft but worth reminding myself. I am very excited to announce my new partnership with Emily van Beek at Folio Jr! Emily and I met a few years ago and am thrilled to have the opportunity to work with her again. She is a consummate professional, incredibly intelligent, and just about the nicest person that you could meet. I am always hesitant to say "my agent". Working with a representative of any kind, I think, should be a partnership. One that has an open line of communication, that is flexible, and one in which we work for and with each-other. I receive many emails from illustrators asking if they should have an agent. While it does help with some things, I always say that it depends on the people and the relationship. Publishing can be tough but when you can work with an agent as a team, you can more effectively steer the course of your career and have a better chance of making books that you can all be proud of for years to come. So if you are an editor or an art director and have a really special book on your desk- give her a call. I love working with Emily and I know that you will as well.